One of my old college roommates, who still remains the most well-grounded person I know today, once told me as we were having one of our daily philosophical conversations that "Your feelings are always valid, don't let anyone tell you otherwise." Are you depressed? Naw, you're probably just a little sad. Watch a funny movie, you'll feel better. Are you worried? There's no need to be. Are you nervous? You'll be fine. Are you angry? Just forget about it and move on. Just like our friends and family (though maybe unintentionally) tell us not to feel; society also often tell us to mask our feelings. "Don't let your feelings get in the way," we're constantly told whenever we're trying to accomplish anything whether it be personally or professionally. In romantic relationships today, it almost seems like if you're showing your emotions, then you're weak. Don't tell someone you love them, they'll probably think you're crazy. Wait a couple hours before texting them back so you don't seem desperate. In our professional lives, we always tell ourselves that it will be worth it in the end, when we finally reach success. Getting rid of our feelings is worth the sacrifice. We hide our emotions so we can "make it." But what are we making really? We're making disingenuous versions of ourselves. Are you feeling depressed? You're not just sad and that's okay and it's okay to know that you can't just "get over it." Do you want to text the person you're dating back right away? Do it! You should be able to talk to someone if you want to for goodness sake! If that freaks them out, then they're not worth your time. Do you have a gut feeling about a business decision? Listen to that, even if others don't consider it a "legitimate" reason to. There's a huge sacrifice in taking away feelings from anything you do. Sometimes, yes, emotions can cloud your thoughts. But they always drive your heart, which is far more important. It is where your passion lives. Without passion, even if you "make it", it won't matter in the end. 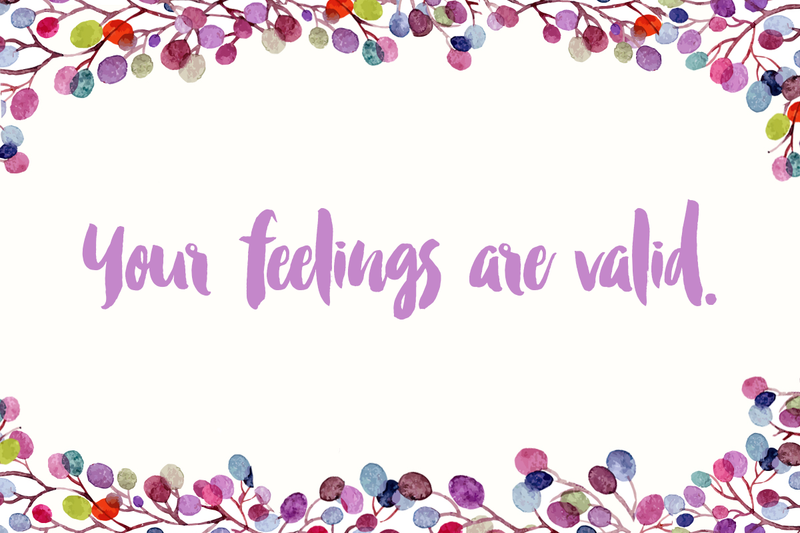 I think that we all need to take a little advice from my dear friend (trust me, her advice has never steered me wrong): Your feelings are valid. We need to make our feelings the heart of the matter again, not the hidden part of the matter.